Interior Secretary Fred Matiang'i has been named chairperson of a newly constituted National Development Implementation and Communication Committee that has all cabinet secretaries as members. 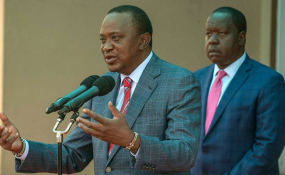 In an executive order issued on Monday, Dr Matiangi will report directly to President Uhuru Kenyatta and will oversee the implementation of all government projects. He will be deputized by Treasury secretary Henry Rotich. In addition, President Kenyatta transferred the management and co-ordination of national transport and safety to Dr Matiang'i docket. The Interior secretary will now be in charge of motor vehicle registration and certification, functions that were previously under the Ministry of Transport. The appointment of Dr Matiangi to oversee other ministries in implementation of government projects has sparked a reaction online with some calling him the new "prime minister." Kipchumba Murkomen wrote; "Congratulations to President @UKenyatta for the Exec Order 1 of 2019 & to my friends CSs Dr.Matiangi & Rotich for the additional responsibilities. We look forward to a more co-ordinated service delivery & greater accountability to the people of Kenya. God bless you @WilliamsRuto." Lee Makwiny added; "This executive order has made Fred Matiangi the second most powerful Kenyan after president Uhuru Kenyatta." Mogire Benjamin commented; "So Matiangi is like a head boy in secondary schools... .making it simple to laymen." Aggidy Okewe stated; "Matiangi is now a PM. Coordination of government ministries was something we saw with Kibaki-Raila pact. This man is powerful." Mufasa Leo commented; "Matiangi lowkey the prime Minister of Kenya." George Kim wrote; "Literally, Dr. Matiang'i will be running the govt..Kenyans. DCI, DPP and Matiang'i are enough to take Kenya to the next level." Atieno Akeyo stated; "The new PM, let him start with watu wa ma tender, awafuate hadi kwa church."